The longan fruit, also known as the Dragon’s Eye (due to its black seed which resembles an eye) is a summertime favourite. Many Thai people enjoy fresh longans with its refreshingly sweet taste. Its benefit does not just lie in the fruit itself but also in the other parts of the plant. People in the old days would boil longan leaves to cure them of colds. Burn its seed until it becomes ash, and this can be rubbed on scars to speed up healing and also soothe itches. Small in size, but abundant in benefits, the longan fruit is said to block carcinogenic substances and reduce oxidants in white blood cells. Another key feature of the fruit is that it can strengthen the body. It specifically has minerals, vitamins, and nutrients, notably Vitamin C and B12, to nourish the blood, nerves, eyes, and heart. Even Chinese medical books give the recipe of boiling dried longan fruits together with ginseng and other medicines to help older adults experiencing forgetfulness. Longan fruits may be rich with nourishment, but a moderate intake is recommended as the fruit itself has a heating effect, meaning that its excessive intake can cause mouth ulcers. The longan fruit’s sweetness is high in carbohydrates or sugar which quickly replenishes the body from any deficiency. The fruit then provides energy to the body. 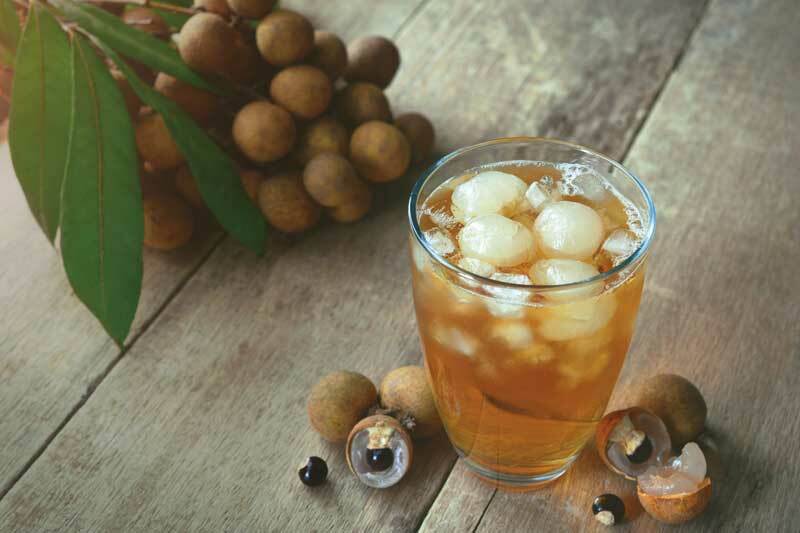 It’s a reason why those who drink longan juice feel instantly refreshed. Hot or iced, regular drinking of longan juice can guarantee a peaceful night’s sleep as well. Another great thing about the longan fruit is that it is excellent for desserts – from longan fruit with sticky rice (a Thai-style sweetened dessert with young coconut meat) to iced longan in syrup. These desserts promise a refreshing taste, thanks to their sweetness of flavour and reviving, aromatic fragrance. Clean the dried longan fruits in water twice to wash away dirt and longan flakes. Pour ¼ cup of sugar in a pot and melt on medium heat. Continue to stir until the sugar liquefies and the colour changes to dark brown. Pour water in and stir until the sugar further melts. Add the dried longan fruits and continue to boil for around 10 minutes. When the longan fruits are softened enough, add the rest of the sugar and salt. Continue to boil and stir until all the sugar is dissolved. Put the lid on the pot and remove from the stove. Leave it to cool down. Before drinking, add ice. The refreshing longan juice is now ready to be enjoyed.